. tsunami 津波 /　つなみ　Tsunami .
. doshakuzure 土砂崩れ landslide legends . In the seventh month of 1728 (享保13年7月) something huge like a mountain was seen far away on the horizon along the coast. The huge thing divided into two, one going East, one going West. On the next day in Edo and ajacent regions a mountain had cracked and water from a Tsunami flooded Edo like a fountain spring. 22 years before this something similar had happened in Ise (伊勢で津波 1708), causing a Tsunami.
. 宝の川 The river of treasures . Before a Tsunami reaches 松前 Matsumae, the figures of 仏神の姿 Buddhas and Shinto deities can be seen flying in the sky to give a warning.
. shinroo 蜃楼 heat shimmers . as the Deity of the Mountain 山の神様. Legend tells, that once the female dragon shapeshifted into a lady, met a young samurai and fell deeply in love with him. But the young samurai died right on the spot. There occurred a huge landslide and two peaks formed, with the scales of the Dragon forming a special mountain shape. 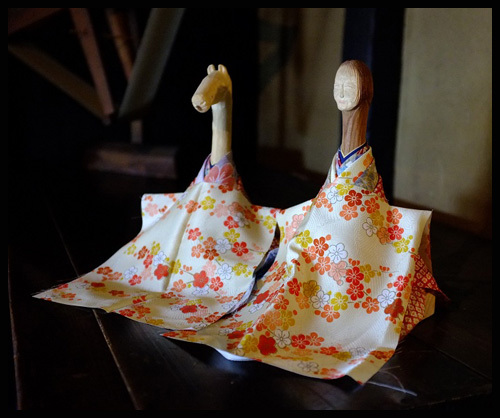 In the 及川家 Oikawa family a pair of オシラボトケ "White Deities" is venerated. But on the New Year's day and on March 13th they are covered with a cloth. When the Sanriku Tsunami came, the house was destroyed but the Shirasama survived.
. O-Shirasama - short for O-Shirase sama お知らせ様 . 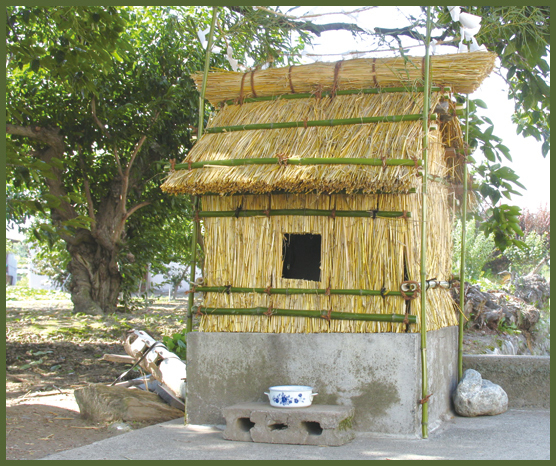 In 1854 the 安政 Ansei Earthquake struck the region and the Toilet Deity of the 竹内長太夫家 Takeuchi family was flooded into the sea. At that time, at the homes of good people, 御札 divine amulets fell from heaven, but on the homes of bad people stones fell from heaven. 竹内長太夫 Takeuchi Chodayu was known as a good fisher of whales 鯨男 and his family still lives in 二木島港 Nigishima harbour . If during an earthquake the deer are calling, there will be no Tsunami. If the dear do not call out, there will be a Tsunami. The Lord of Shimabara had been hunting in the forests around 雲仙嶽 Unzen volcano, where he saw two large serpents and killed one of them, wounding the other. Soon after the fields of the region were destroyed by some wild animal and there was no harvest this year. People thought it was the doings of the one serpent that survived. Anyway, there was a doctor called 多比良 Taira who treated a woman for her wounds. She told him that her husband had been killed and in his revenge destroyed the fields. She was greatfull to the doctor and also told him he should run away, because soon the volcano would erupt and a Tsunami would come and bring more disaster. So this huge earthquake and Tsunami in 1729 was the curse of the serpent 大蛇の祟り. Taira 多比良町 is now a place name in Unzen . . . 長崎県雲仙市国見町船津. In 佐伯市 Saiki town, a statue of 観音様 Kannon Bosatsu came rolling in during a tsunami. The statue was caught in the net of a fisherman, and its halo was sparkling. Other versions tell of a tree floating in the waves and when they cut it, blood came flowing out of the cut. So they made a Kannon Statue to appease it. In the village of 白保村 Shiraho there were three families living under arrest. Once they caught a human fish and wanted to eat it. Before they cut it open the fish talked to them and told them of a coming big Tsunami. Afraid they threw the meat back into the sea and apologized for catching the fisl. And just so, a big Tsunami came and destroyed the whole village. But the homes of these three families were saved. 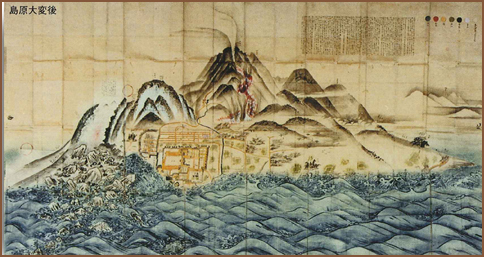 This was 八重山地震 the Yaeyama Earthquake of 1771, with a Tsunami of 60 meters, killing 1574 people in Irabu alone. The 1771 Great Yaeyama Tsunami (also called 明和の大津波, the Great Tsunami of Meiwa) was caused by the Yaeyama Great Earthquake at about 8 A.M. on April 24, 1771, south-southeast of Ishigaki Island. ..... 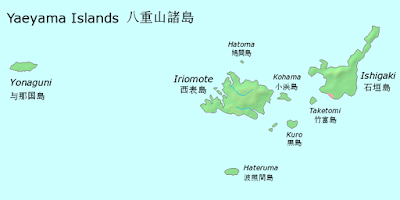 The dead and missing amounted to 12,000 people, and more than 2,000 houses were destroyed on Ishigaki and Miyakojima. Once a rich family caught a fish called ユナイナマ Yudainama and cut it for a meal. But this fish is the messenger of the 海神の使者 Deity of the Sea. So the Sea God became angry and sent a Tsunami to destroy the home of the family. "Come home soon, hurry!" 早く帰って来い. "Please come and get me, fast!" 迎えに来てくれ. And right then a Tsunami rolled in and destroyed the whole village. In 富盛村 Tomimori village near the ギーザという泉 Giiza spring three women went to worship at 具志頭 Gushikami. One of them had menstruation and washed her underwear in the spring. This was a serious ritual pollution and at once a tsunami welled up from the sea and killed all three women. In the 賀茂郡 Kamo district there lived the マキヤ Makiya family and their home was swept away by the huge tsunami. The family members were saved by a huge Norota eel ノロタ（海鰻. Since then this family never eats any kind of eel. Once there came shiroi hige no roojin 白いひげの老人 an old man with a white beard. He warned the residents of Shimoda before a Tsunami and told them to evacuate to the mountain, 下田富士 Shimoda Fuji. After the first Tsunami hit the town, he warned the people again: "There is another big Tsunami coming, so don't go home yet, stay here on the mountain!" And when the last big Tsunami had hit, there was a sparkle in the sky and he flew off. This was in fact namikiri Jizo 波切り地蔵, "Jizo cutting the Waves". There are some statues of Jizo with various names, indicating the place where a huge Tsunami stopped after destroying a village.
. namikiri Jizoo 波切り地蔵 Jizo Bosatsu cutting the waves . namiyoke Jizoo 波除け地蔵 "Jizo warding off the wave"
In 1701 in the Hoei period, there was a famous Shamisen player. One day he went to Shinagawa for a concert with his troupe, whne the sound of his Shamisen sounded quite stange to him. This is the forebode of a Tsunami, he understood. So he and his friends left fast. And indeed, soon the tsunami came and many houses and lives were lost. At the graveyard of the temple 来福寺 Raifuku-Ji there is a Hokora sanctuary for a serpent, indeed for a nine-headed dragon 九頭竜の祠. Once when the dams of the river had broken during a landslide, a huge serpent had curved its body along the riverbank to protect the homes from flooding away. We are afraid of the Tsunami coming with the Big Nankai Earthquake. are great megathrust earthquakes that occur along the Nankai megathrust – the fault under the Nankai Trough – which forms the plate interface between the subducting Philippine Sea Plate and the overriding Amurian Plate (part of the Eurasian Plate), which dips beneath southwestern Honshu, Japan. The fault is divided into five segments in three zones, which rupture separately or in combination, and depending on location, the resulting earthquakes are subdivided by zone from west to east into Nankai earthquakes, Tōnankai earthquakes, and Tōkai earthquakes. ..... All of these great earthquakes have resulted in damaging tsunamis, which are particularly damaging due to the Japanese population being concentrated on the Taiheiyō Belt, especially the coastal cities of Tokyo and Osaka, the two most populous in Japan. 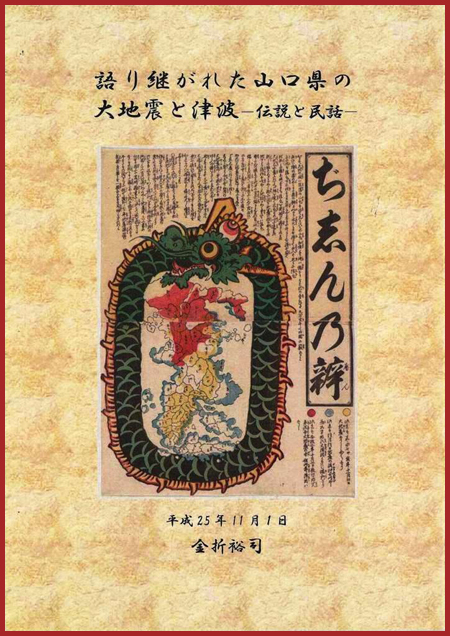 白鳳地震は、『日本書紀』に記述があり recorded in the Nihon Shoki. The first recorded tsunami in Japan, it hit on November 29, 684 on the shore of the Kii Peninsula, Nankaido, Shikoku, Kii, and Awaji region. The earthquake, estimated at magnitude 8.4, was followed by a huge tsunami, but no estimates exist for the number of deaths. The Sendai region was struck by a major tsunami that caused flooding extending 4 km inland from the coast. The town of Tagajō was destroyed, with an estimated 1,000 casualties. There was a strong earthquake in Osaka, Shiga, Gifu, and Nagano prefectures. A tsunami flooded the coastal region, and some people died. The coast of Osaka and primarily Osaka Bay suffered especially heavily, and the tsunami was also observed on the coast of Hyuga-Nada. A magnitude 7.1 quake and tsunami hit Kamakura, then Japan's de facto capital, killing 23,000 after resulting fires. On September 20, 1498, during the Meiō era, a 7.5 earthquake and tsunami hit. The port in Wakayama damaged by a tsunami several meters high. 30–40 thousand deaths estimated. The building around great Buddha of Kamakura (altitude 7m) was swept away by the tsunami. On February 3, 1605, in the Keichō era, a magnitude 8.1 quake and tsunami hit Japan. 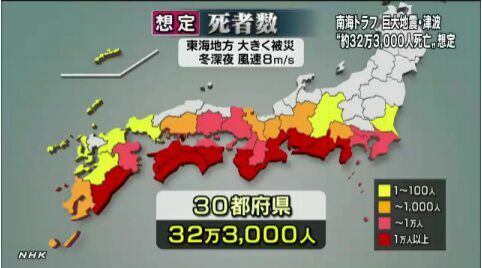 An enormous tsunami with a maximum known height of 30 m was observed on the coast from the Boso Peninsula to the eastern part of Kyushu Island. On December 22, 1698, a large tsunami struck Seikaido-Nankaido. On 28 October 1707, during the Hōei era, a magnitude 8.4 earthquake and tsunami up to 10 m in height struck Kochi Prefecture. Till Osaka. ... Hot springs at Yunomine, Sanji, Ryujin, Seto-Kanayana (Kii) and Dogo stopped flowing. M6.4 - Tsunamis were the main cause of death for Japan's worst-ever volcanic disaster, an eruption of Mount Unzen in Nagasaki Prefecture, Kyushu, Japan. The Ansei quake which hit the south coast of Japan, was actually a set of three earthquakes, two magnitude 8.4 quakes and a 7.4 quake over the course of several days. ... Wakayama tsunami reached as high as 8.4 m.
M7.1, hit the Tokyo region of Japan, killing 4,500 to 10,000 people. M8.5 - On 15 June 1896, ... the waves, which reached a height of 100 feet (30 m), killed approximately 27,000 people. In 2005, the same general area was hit by the 2005 Sanriku Japan earthquake, but with no major tsunami. ... on 1 September 1923, and devastated Tokyo, Yokohama, and the surrounding areas, caused tsunamis which struck the Shonan coast, Boso Peninsula, Izu Islands and the east coast of Izu Peninsula, within minutes in some cases. In Atami, waves reaching 12 meters were recorded. 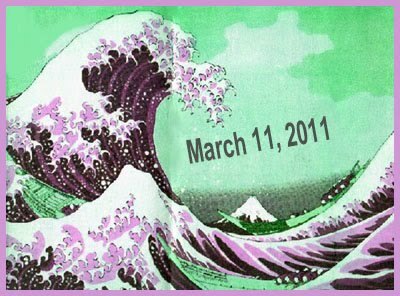 M 8.4) On March 3, 1933, ... tsunami waves as a result of an offshore magnitude 8.1 earthquake. The quake destroyed about 5,000 homes and killed 3,068 people, the vast majority as a result of tsunami waves. A magnitude 8.0 earthquake on 7 December 1944, about 20 km off the Shima Peninsula in Japan, which struck the Pacific coast of central Japan, mainly Mie, Aichi, and Shizuoka Prefectures. ... the quake is estimated to have killed 1223 people, the tsunami being the leading cause of the fatalities. 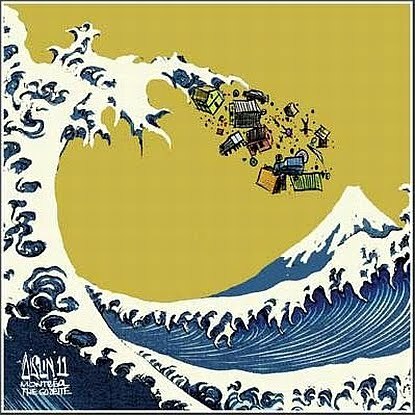 The tsunami that washed away 1451 houses and caused 1500 deaths in Japan. M7.5 - The subsequent tsunami destroyed the port of Niigata. On May 26, 1983 at 11:59:57 local time, a magnitude-7.7 earthquake occurred in the Sea of Japan, about 100 km west of the coast of Noshiro in Akita Prefecture, Japan. Out of the 107 fatalities, all but four were killed by the resulting tsunami, which struck communities along the coast, especially Aomori and Akita Prefectures and the Noto Peninsula. A devastating tsunami wave occurred along the coasts of Hokkaido in Japan as a result of a magnitude 7.8 earthquake, 80 miles (130 km) offshore, on July 12, 1993. ... it was too late for Okushiri, a small island near the epicenter, where some waves reached 30 meters and struck within two to five minutes of the quake. On March 11, 2011, off the Pacific coast of Japan, a 9.0 magnitude earthquake produced a tsunami 33 feet (10 m) high along Japan's northeastern coast.
. Natural Disasters 自然災害 shizen saigai - Naturkatastrophen .